Welcome to Oahu, Maui Doug! 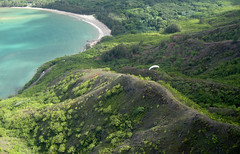 I enjoyed some sweet sea breeze flying at Kahana today with Maui Doug, a recent transplant to Oahu and a brand new pilot. He is also a big time kitesurfer so I'm sure he'll be meeting lots of you out on the water as well. He enticed me to come out and fly on a day when I had doubts about how it might be working, but it turned out to be one of those days with a fat but gentle lift band, as smooth as butter, although pretty light on launch. Doug scratched mightily for a long time to get started, trying to follow my clumsy radio supervision, even whacking a tree deep in the valley of despair at one point - but he finally worked his way up and above the ridge. Not bad for his first ever ridge soaring flight. I followed him up there, and we flew for over an hour up and down the ridge in slowly waning conditions until I thought it might be time to precede him to the LZ before the lift died out too much. Superb launch, soaring and landing for a new pilot. Keep up the good work, Doug - and welcome to Oahu flying! I got the Makapuu report from Don: sounds like you guys had a busy afternoon out there! Most folks launched from Juice. One-eye Jim, Alan G. (just for the hike), Jared, Frank, Jorge (flew to Sandys), Don, Scrappy (only one who launched from Manics), Reaper (showed up late and flew the cooler), and Ginny (stopped to say Hi). I'd love to read a first hand report or see a picture if anyone else is moved to share! Thank you so much Alex for your guidance yesterday at Kahana. I still feel the rush going through my body. Wow, what an amazing experience staying in the air for so long! I just recently received my P2 rating from Dexter on Maui and moved here to be with my girl friend Shelly. I am blown away by the beauty and beaches here on Oahu. Also, thanks so much for the warm welcome and kind words. All of the Oahu pilots that I have met so far have been very welcoming and eager to answer my questions. I feel fortunate to be around such a warm hearted group of people.